PTG Basketball 2.0 is an enjoyable full-play college basketball simulation game that offers some of the advanced gameplay that basketball aficionados will crave, while not sacrificing playability, so that it should appeal the more casual basketball fan, as well. College teams now available!! 2016-17, 2017-18 sets in store! PTG Basketball 2.0 takes the original game to new heights of detail. PTG 2.0 moves to a 2d10 and 1d6 method. Shots are now taken as a 2-pt Rim, 2-pt Jumper, and 3-Pointer. The rim shot is a shot taken within a couple feet of the basket. Assists are now looked at through the player actually taking the shot. Rebounds are resolved with a single roll and take both players into account. Probably, the biggest change is the stamina system. We have moved to a per possession over a time clock method. Every player and team are taken into account in the game clock. Check the video above for an example. Rare Plays have been narrowed to one chart. The game is tied with less than 30 seconds to play. Just about everyone in the building expects the superstar scorer from the visiting team to get the ball in his hands to take the potential game-winning shot. Everyone is standing—fans and players alike. Chants of “DEE-FENSE…DEE-FENSE” rock the arena. The clock ticks down. But the superstar doesn’t get the basketball. His teammates are unable to get it to him, thanks to great ball denial by the home team. The fans are relieved to see a secondary player from the visitors hoisting a jump shot as the clock ticks closer to 0:00. But that secondary player drains the 15-foot jumper, a dagger into the hearts of the home crowd. Down by two and the time almost gone, the home team takes a timeout and designs a buzzer-beating play. Will they go for the tie or try a desperation three-pointer to win the game and send the fans home deliriously happy? Could you picture the above scenario in your head? If you’re a follower of pro basketball, no doubt you did, because moments like those occur almost nightly in some arena, somewhere. It’s also a scenario that plays out in PTG Basketball, a re-introduction of Basketball Bones tabletop basketball game that uses four dice and individual player cards to re-create exciting pro basketball action that includes just about everything that happens on the hardwood! In most instances, the superstars will get the basketball in “crunch time,” because each player is rated for how often he is the focus of his team’s offense. But the beauty of PTG Basketball is that, just like in real life, pro basketball is a player’s game, and sometimes the plays drawn out on the dry erase board break down. You get it all with PTG Basketball—rebounding beasts who dominate the boards; ball-handling wizards who have that innate ability to find the open man for a high percentage shot; “money” free throw shooters who you don’t want to foul with the game on the line; three-point threats whose range extends to downtown; ball-hawking defenders who are “pick pocket artists”; and even clumsy, ham-handed defenders who commit fouls quicker than you can blink an eye. In PTG Basketball, every player who suited up for that season gets an individual card rating him in every aspect of the pro game, from shooting frequency to field goal success to rebounding to defense, and more! The game is easy to set up and play. There are no laborious charts to constantly consult. Some possessions are resolved with one throw of the four dice. 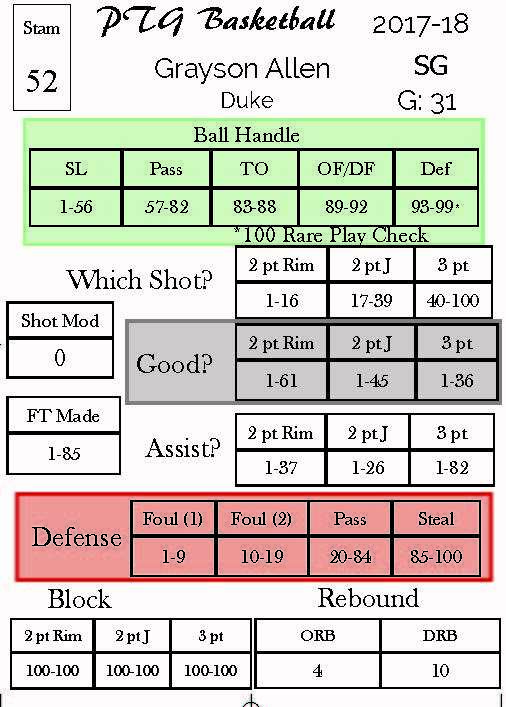 The player cards are the integral parts of an engine designed to keep game play flowing like a well-executed fast break. But basketball isn’t just shooting and rebounding. Every game, every night, can include various elements which may affect the outcome: the home court advantage; momentum shifts; a bad night from a key player; a wayward referee’s whistle; and of course, that old bugaboo—injuries. They all can happen in PTG Basketball, too, thanks to the included Rare Play Boards, which bring those elements, and more, into your contests. Maybe a loose-lipped player says the “magic word” and gets slapped with an ill-timed technical foul. Maybe a wet spot on the floor causes your big man to slip and collapse to the floor like a house of cards, resulting in an injury. Maybe a brief spurt by the home team causes a change in momentum and leads to an even bigger and more damaging run. 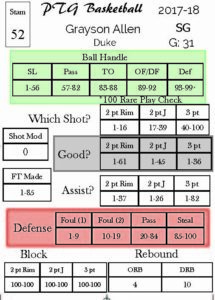 PTG Basketball is presently available in the PDF format and includes everything except the dice for gameplay, including 2 sample teams. PTG Basketball is unlike any other, because it combines simplicity with realism, making for a fun, fast, statistically-accurate pro basketball simulation.